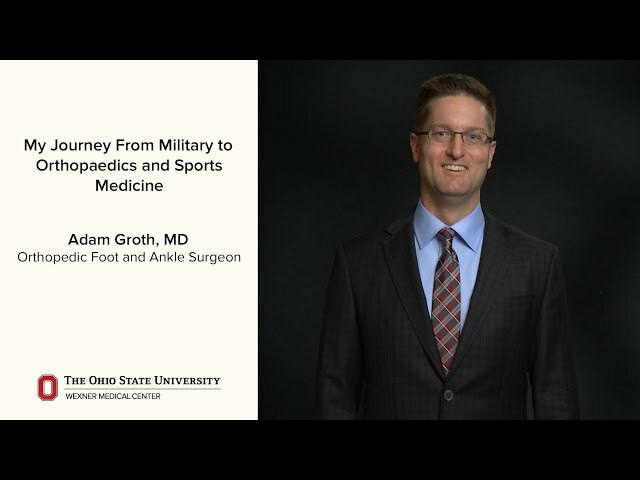 I joined Ohio State after working in Army Medicine, managing a broad spectrum of patients with foot and ankle disorders. From experience in austere environments, I honed my skills in out of the box solutions for both simple and complex challenges. I enjoyed working with a team of subspecialists to get our soldiers back to duty as quickly as possible. At Ohio State, we have a strikingly similar team and opportunity to expand medical solutions. We have a phenomenal group of physicians working to get individuals back to the activities they enjoy and I also continue to pursue my research in microfracture, cartilage restoration for the talus and ankle arthritis. I provide care for a variety of foot and ankle conditions in my clinical practice, ranging from sports injuries to trauma to deformities, reconstruction and arthritis. My approach is to get to know the patient, how their problem affects their life and what their overall goals are. I believe patients should know all of the options that are available to them and to create a treatment plan together to get them back to the the level that they want to be. He was friendly and easy to talk to. He reviewed my x-ray with me, explained the diagnosis, and offered the opportunity to ask questions. Very honest straight forward with prognosis. Very good visiting after surgery. explained surgery options that might occur based on what the discover in surgery. He did not seem overly concerned and I would have rather went straight to the phyisical therapist because they were really helpful. Good experience but should describe a long term plan better, even though my problem wasn't sever. As of 12/20/2018, Dr. Groth has reported no relationships with companies or entities.